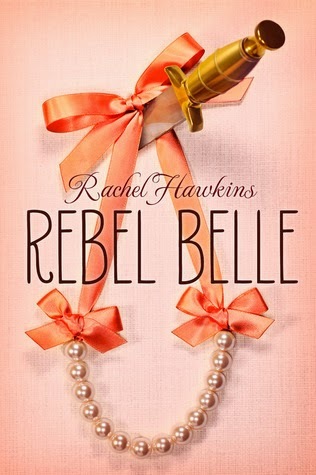 I read Rebel Belle by Rachel Hawkins literally a month ago, but it was one I really wanted to review so I've finally gotten around to writing this review. So much happened in this book took me awhile to work out what I wanted to say. Nevertheless here it is. I gave this book 4/5 stars on Goodreads and although I enjoyed this book immensely, there were many aspects that irritated me in relation to characters and the plot. But before I go into the negative I thought I’d first talk about the positive. p.s there will be spoilers (although nothing too specific or anything that wasn't obvious after reading the first few chapters). I really enjoyed the way Rebel Belle was written from Harper’s POV and I found it really helped set the tone to the book and kept it light hearted. The plot was fast paced and action packed, which made it a really fun read. This book was hilarious! The character reactions to events were so funny and yet they felt quite genuine. I was often literally laughing out loud, which may have drawn odd looks from my family. Oops. The plot was pretty simple so far, however I have a feeling this will change with the next books. I really like it when series do this as it can be kind of annoying when you’re thrown into the deep end of a book. I always find the whole fantasy world in Southern USA really interesting as it seems so conflicting and because of that Rebel Belle kind of reminded me of Beautiful Creatures, which I really like. I really didn’t like how Rachel Hawkins wrote Harper’s relationship with Ryan. It felt a little convenient and I really hated it how Harper was completely neglectful and yet it was often made out that Ryan was just being needy. She also obviously wanted Harper to move on to David and because of that I felt like she didn’t bother giving Ryan much of a personality. It bothers me when there are love triangles and the author feels the need to make one boy a lesser being in some way to justify the choice of the girl. There were some instances in the book when the characters had conveniently, uncharacteristic dumb moments which moved the plot forward but also seemed unrealistic. So I’m no oracle, but my predictions for the next books is that we’ll find out that the Ephors wanted David to become mega-oracle so they can use David’s power to make themselves more powerful. It practically says so in page 298 (hardcover version).